Admissions Open at University of Engineering and Technology, Lahore's Main Campus, Lahore for the batch Fall 2018. UET offers admissions in different fields of study for PHD Programs. Funded PhD Positions, Full Time Research Associate positions are available on merit for candidates fulfilling the qualifying requirements. Computer Science (CS), Computer Engineering (CE), Chemical Engineering/Technology, Civil Engineering/Technology, Electrical Engineering/Technology, Architecure, City And Regional Planning, Metallurgical & Materials Engg., Environmental Engg., Transportation Engg., Architectural Engg., Mining Engg., Petroleum And Gas Engg., Manufacturing Engg., Mechanical Engg. and Mechatronics & Control Engg. Phd EligibilityAtleast 70% marks in subject test conducted by UET, Lahore, accredited 18 years equivalent Masters degree with atleast 70% or CGPA 3.3 out of 4 under semester system. 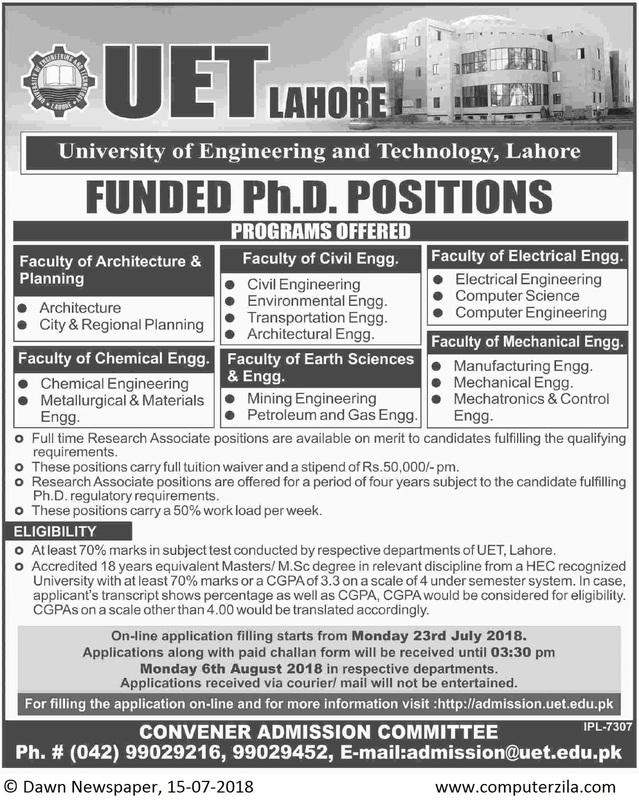 University DescriptionThe University of Engineering and Technology Lahore (abbreviated as U.E.T Lahore) is a public research university located in Lahore, Punjab, Pakistan specialising in STEM subjects. Founded in 1921 as Maclagan Engineering College, it was named after Edward Douglas MacLagan. In 1932, the school became an affiliated college of the University of Punjab and began offering undergraduate degrees in engineering disciplines. In 1962, the university was granted a charter and renamed as the West Pakistan University of Engineering. In 1972, the university was renamed as UET. It established a second campus in 1975 in Taxila, which in 1998 became an independent university in its own right.